Despite the fact that they can’t enter any venue without X’s on their hands, The Regrettes prove to their listeners that raw talent and musical skill does not come with age. After breaking into the spotlight in 2017 with their debut album Feel Your Feelings Fool!, these kids have hit the L.A. music scene like a wrecking ball. They’ll be making their way through the U.S. at this year’s most renown festivals such as Coachella, Bonnaroo, Treefort Music Fest, Governer’s Ball, and Firefly Music Festival. Earlier this month, they released the empowering music video for their latest single “Come Through” which was produced, directed, edited, and shot by an all-female team. Yesterday (Feb. 22), as a precedent to the release of their five track EP titled Attention Seeker (WBR), the local L.A. band hosted a EP release show at the Bootleg Theater. They proved that they deserve every ounce of critical acclaim they have garnered. 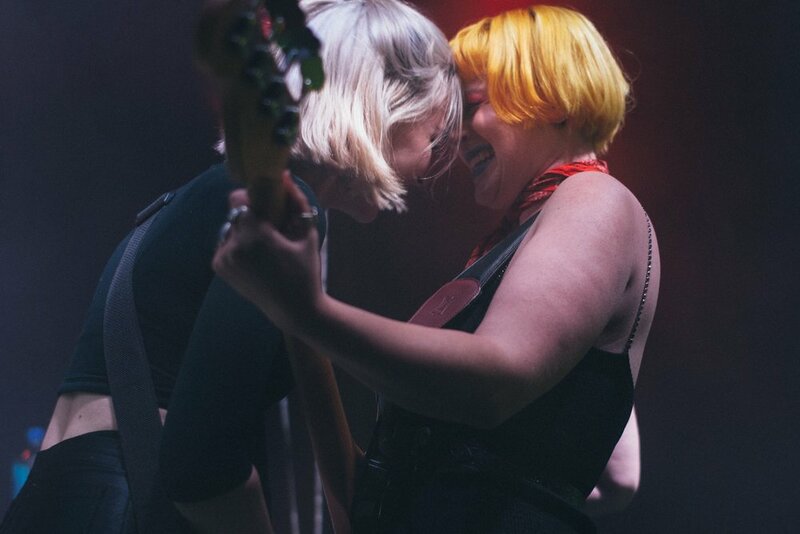 Comprised of Lydia Night, 17, (guitar and vocals), Sage Chavis, (bass), Genessa Gariano (guitar), and Maxx Morando (drums), the band’s energy onstage was one that welcomed the audience and made every onlooker feel as if they were a part of the action. With lyrics like, “You’re talkin’ to me like a child/ But I’m not a helpless baby/ Not waiting on your to come save me,” The Regrettes are as impenitent as they are ingenuous. Their blatant, honesty laced thoughts prevail throughout their pop-punk inspired songs, allowing anyone who attends their live shows to witness the contagious energy that they radiate. Using political discourse as their muse, the Regrettes represent themselves as positive female representation (sans Maxx) to their predominantly teenaged audience. While pop and uplifting on the surface, almost every song contains a strong undercurrent of anger and awareness of the need for justice that is presented in a way that is easily digestible for younger ears. While singing outwardly feminist anthems, singer Lydia Night embodied what it means to be a front-woman as she energetically bounced on stage, pulled crazy facial expressions, and smiled ear-to-ear as the audience pulsated below her. Perhaps the most powerful moment of the night was the moment in which she dived offstage in order to dance in the center of an audience. All of the young girls below could not wipe the smiles off their faces. In this moment, you could see Night’s reflection in their eyes—giving them confidence as they saw a girl like them blossoming.